At Valley Animal Hospital of Merced, we repair all kinds of broken bones and ligaments. From bone plating to pinning to ruptured anterior cruciate (ACL) surgery, we do a lot of bone surgery!!! We use the Extracapsular Technique for ruptured ACL (Cranial or Anterior Cruciate Ligament) with an excellent success rate and a quick 'return to function' than most other surgeries on the knee. 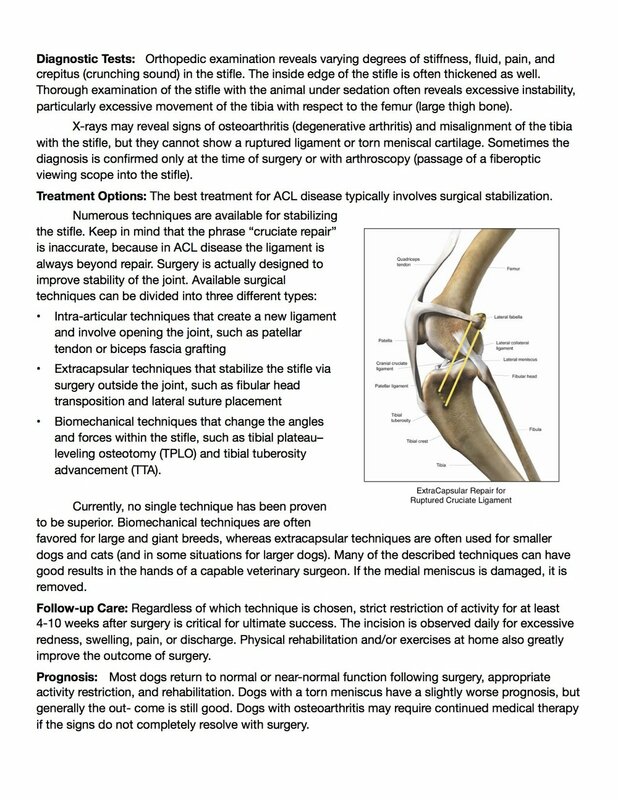 See the link and graphics below for more information about our orthopedic surgeries! The yellow lines represent replacement ligaments that are used to stabilize the knee when the ACL has ruptured. Click the document below for a downloadable copy! The Yellow arrow shows the fracture and the Red arrow shows another hairline break. X-Ray 2: Ten Days Later-- the Orange arrow highlights the 3 "cerclage wires" encircling the bone to hold the fragments together. Also, there is a large pin in the marrow cavity. X-Ray 3: One Month Later-- the Green arrow shows fuzzy bone called "callus"-- this fracture is stable, completely healed (no more hairline fracture lines) and ready for pin removal!